Inveterate Imperial typewriter collector Richard Amery will be a little down in the dumps today, following the failure yesterday of the Australian Labor Party - which he represented so honourably in the New South Wales Parliament for 32 years to 2015 - to wrest back power in NSW from a conservative coalition. No doubt Richard will be able to cheer himself up by tapping away on one of his latest acquisitions, an Imperial Caravan. The Royal Caravan is the same typewriter. They were both made for Litton in the Netherlands. This bottom image first appeared on my blog on February 13, 2013, from a US eBay auction. Just as Imperial used the model name Caravan under Litton, so too did Royal use the model name Companion. Never heard of an Imperial Caravan? Neither had I until last week, when Richard sent me images of this cute variation on the Adler and Triumph plastic Tippa. It had been unearthed somehow –as is his want – by Philip Chapman of Charlie Foxtrot fame, and naturally the first recipient who came to Philip’s mind was Richard. After all, until Philip and his wife Julie left Australia to set up their typewriter business in England, Philip had been a regular attendee at Richard’s weekly typewriter gatherings in Sydney, where Imperials abound. In Blighty, Philip had also found an equally rare wide carriage Imperial Desk Companion for Richard. About the same time as I heard from Richard about his Imperial Caravan, somebody signing himself just “Mike” commented on my blog post titled “Litton’s Typewriter Empire: Its Rise and Fall” from June 2, 2012. “Mike” said “I came here looking for information on a recent find” but found the post “wonderfully confusing … The way these companies fit together is confusing.” His find is a sandy coloured Royal 203. “The sticker on the back says it was made in Japan for TA Organisation. It looks very similar to the 203 in your story above but does not have the Litton logo next to Royal. From your descriptions I would think my typewriter was made in Japan in the 60s prior to Litton purchasing Royal.” Talk about confused! Royals weren’t made in Japan until after Litton had acquired the company in late 1964. It's a Japanese-made Litton Royal 203 all right. Admittedly, “Mike” isn’t entirely alone. Richard Amery was also somewhat mystified by his Imperial Caravan, which was made in the Netherlands but is not identified as a Litton product. It is, however, a machine made for Litton, just like the West German (Adler) made-Imperial 90 standard typewriter which Richard got from me four years ago. The Imperial badges are naturally slightly different from those which appeared on the Japanese-made machines. The bottom line, however, is that Litton owned Royal from December 1964, Imperial from October 1966 and Triumph-Adler from July 1974. It stopped producing typewriters in Britain in early 1975, moving production to the Netherlands. The three brands were sold to Volkswagen in mid-1979, and to Olivetti in April 1986. So any Royal or Imperial made between late 1966 and mid-1979 was made for Litton. The Imperial Caravan is more commonly seen as the plastic Adler or Triumph Tippa or Tippa S, also made for Litton in the Netherlands. As for the model name Caravan, it had previously been used for a variation of the US-made Royal Safari-Sabre-Custom, the Royal Caravan being the model used by Bob Dylan in photographs taken by Douglas R. Gilbert as Dylan was typing the liner notes for his fourth album, Another Side of Bob Dylan, in his writing studio above the Café Espresso on Tinker Street, Woodstock, New York, in August 1964. Ho, ho, ho ... Ho and I share a wee joke about Earl Tiffany's remark. We’re left wondering, of course, whether Tiffany could have been serious. 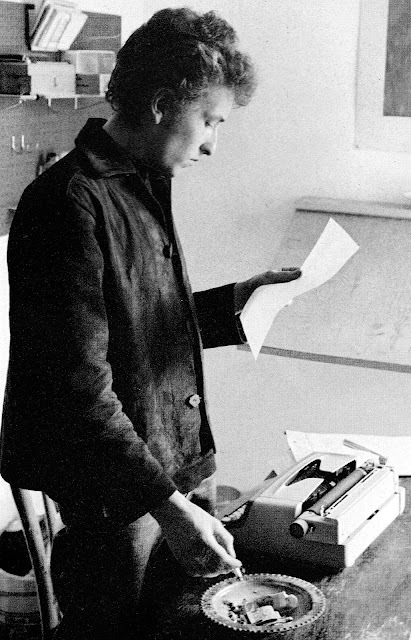 What we do know is that in 1966 his confidence in the immediate future of the manual portable typewriter was flying exceedingly high. 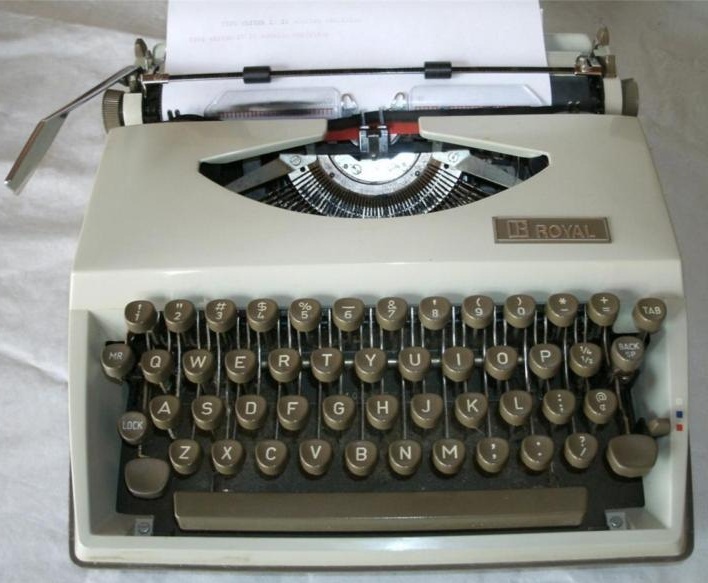 Earlier that year, Tiffany had been widely quoted as estimating that by the early 1970s, annual portable typewriter sales in the US would reach three million. He said the portable would be a “regular kitchen appliance in the two and three-typewriter home”. 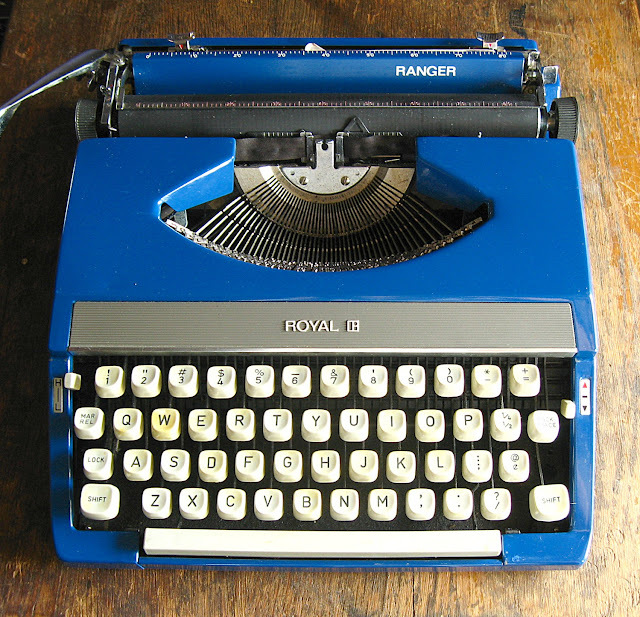 One in four homes had a typewriter, leaving the market 75 per cent untapped. 1. LIFE, December 4, 1964. 2. LIFE, November 13, 1964. 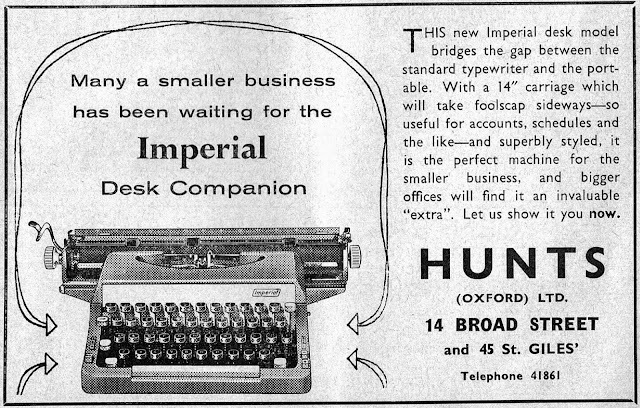 These are the sort of words one might have expected to read in the mid-1920s, perhaps, when Royal joined a portable market already dominated by Corona, Underwood and Remington. But mid-1966? Surely business experts could not have been that blind to what lay ahead? And not just for Royal, but for manual portable typewriters in general. 3. LIFE, September 4, 1964. In the short term, the forecasts of Tiffany and Porter proved accurate. 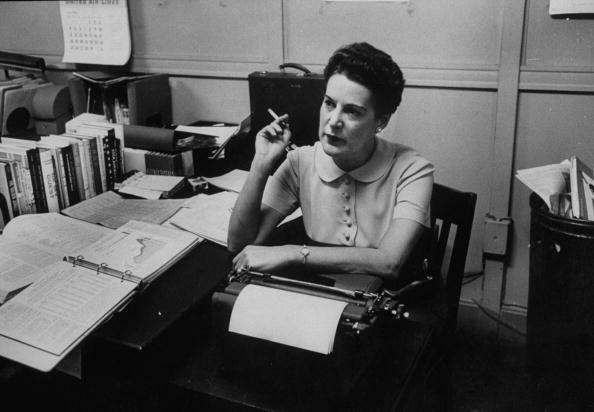 As early as January 29, 1967, Tiffany announced that total US typewriter sales had risen the previous year by 17 per cent, to a record 2.755 million. But Tiffany was already adjusting his thinking, forecasting “a more limited rate” of gains in 1967. His 1967 target was close to 2.9 million, representing more than $400 million in sales. As well, Tiffany saw a “dynamic” expansion in the electric typewriter market. The focus had quickly changed. 4. LIFE, May 22, 1964. In hindsight, it’s easy to see that the beginning of the end began when Royal McBee stockholders voted in New York to merge with Litton on December 4, 1964, the merger being ratified by Litton shareholders in Santa Monica on December 12. Royal became a wholly owned Litton Business Equipment Group subsidiary in February 1965. At that time Royal had 10,500 workers in the US, at plants in Hartford, Connecticut, Athens, Ohio, Springfield, Missouri, and Ogden, Utah, as well as factories in Canada, Holland and Portugal. Three months before the merger was first mooted, in September 1964, Royal’s annual sales were reported to be $116.6 million for a net income of $1.89 million, compared to Litton’s $685 million sales and $29.6 million profit. Litton also had 46,000 employees and 90 plants in 24 states and 15 overseas countries. 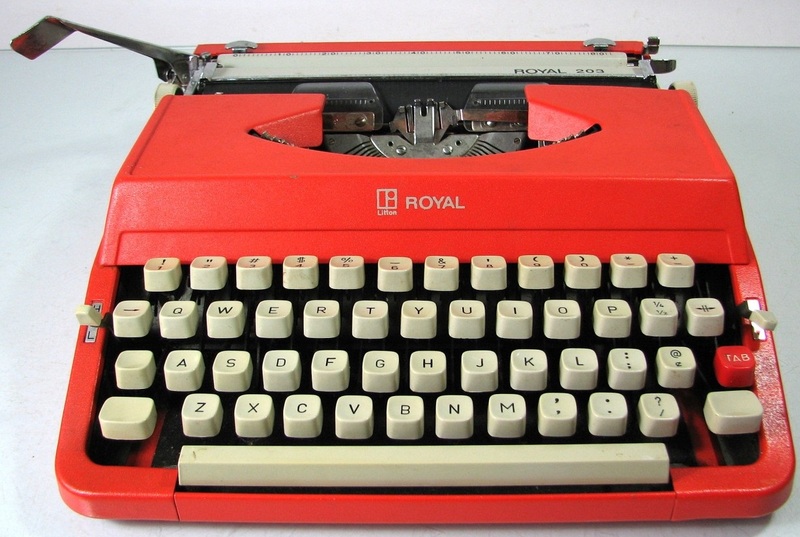 By 1968 Litton’s Royal typewriter division was already in financial difficulties, and Litton felt it necessary to expand in order to consolidate. In October that year Litton’s acquisitions had engulfed Cole Steel, Imperial, Messa and Triumph-Adler. But with its $51 million German takeover, aimed at “bolstering its Royal typewriter division,” Litton ran foul of the US Federal Trade Commission, an obstacle which exposed its huge reliance on German portable typewriter manufacture. Litton claimed that if its German arm were cut off by the FTC, it would be forced to sell its burdensome Royal division and “leave IBM virtually alone in the US typewriter industry.” In early April 1969 the FTC met Litton, headed by Richard M. Nixon adviser Roy L. Ash, a Beverly Hills industrialist, to discuss the FTC’s opposition to the Triumph-Adler takeover. The FTC believed the acquisitions “might have the effect of reducing competition in the US typewriter market.” Litton offered a deal under which it would only have to divest itself of Triumph-Adler’s US operations. The FTC rejected this and charged Litton with violating antitrust laws. Litton immediately brought diplomatic pressure to bear, claiming the FTC decision would be seen as an “insult to the sovereignty” of European governments and would have huge foreign policy ramifications. On top of all this, Litton shut down Royal’s Springfield plant on April 23, 1969, and was forced to deny it planned to also close the Hartford factory, sack 2500 workers, and move operations to Silver-Seiko's Japanese assembly plant with an annual capacity of 600,000 typewriters. By this stage Robert F. Stewart had succeeded Tiffany as Royal president, as industrial battle lines began to be drawn. Less than a year later, in March 1970, with Ronald L. White now Royal president, Litton revealed it and Silver-Seiko had asked the Japanese government for permission to combine in a joint venture to own Marukoshi Kogyo, maker of portable typewriter parts. Marukoshi Kogyo was already making parts which were assembled by Silver-Seiko and sold as Royal and Imperial typewriters. Philadelphia Inquirer, March 7, 1970. Litton finally got the all-clear from the FTC to retain Triumph-Adler in July 1974, by which time the damage had been done. 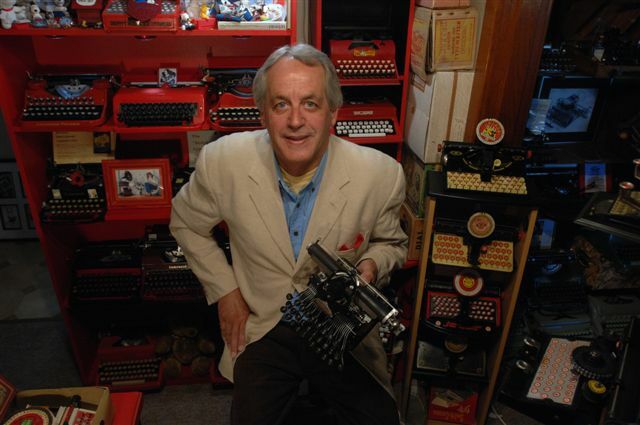 Administrative Law Judge Alvin L. Berman said Litton would have had to go out of the typewriter business if forced to sell Triumph-Adler, so a ruling that Litton’s holding of Triumph-Adler was anti-competitive would, in itself, be anti-competitive. But matters weren’t helped by British dockers blocking a changed barge transfer system in Hull, forcing Litton to close the Hull factory in 1975. It was part of a widespread US bail-out from Europe, marked by a $1 billion drop in annual US investment. In fairness, Litton’s Imperial division had lost $10 million in two years. By February 1977, with John W. Gilluly, Royal’s fifth president in 10 years - James M. Mills was the fourth, following White - the end was nigh. All these years later, it is easy to see that rising labor and production costs— both in the US and Europe—contributed to the demise of manual portables, making companies such as Royal vulnerable to Litton. As well, Royal had been facing increasingly hostile industrial relations problems in Hartford since 1953. Could any of this have been avoided? Well, not with the capacity of Japan to produce far more and far cheaper machines. And perhaps not with the lack of realism being expressed by Earl H. Tiffany Jr back in 1966. A Silver-Seiko (Silver-Reed) Litton Royal Ranger. Another well researched contribution to this dramatic period in the history of the typewriter. For the collector of typewriters, LITTON's contribution was a sad time for companies they took over from the mid to late 1960s. The Caravan is another example of the large number of machines that continue to surface with IMPERIAL badge on it.One thing that appears to be missing from this jigsaw is to find machines that were sold after 1979 when the brands were owned by VOLKSWAGEN and OLIVETTI.- a period of some 7 years.I had thought that perhaps this CARAVAN and the IMPERIAL 90 were such machines because of the absence of the LITTON logo. Must keep searching. Richard, I can see now that you’d love nothing better than to combine two of your interests by owning a VW-made Imperial. But I fear you may be disappointed. When VW “took over” Litton’s typewriter interests in March 1979, all it really did was take a controlling 55% stake in Triumph-Adler (not Litton Industries itself), leaving Litton with 19% from its previous 85% holding. Diehl also had a stake. Triumphwerke AG (Frankfurt) made Royals, Imperials, Adlers and Triumphs. VW passed on the distribution to Office and Electronic Machines (OEM), which had sole rights in Britain and Ireland, and in which VW had an 11% stake. Primarily, however, VW and OEM were only interested in computer components and calculators, not manual typewriters. I very much doubt you will find a manual typewriter that was actually made by VW, but at best possibly one made by TA in Frankfurt under VW’s controlling interest. Perhaps. It was the same thing when Olivetti got TA from VW in July 1986 - the interest was almost exclusively in electronics, not manual typewriters per se. PS: I note that on Ted Munk’s very extensive serial numbers database, Imperial portables go up to 1979, but the Caravan isn’t mentioned. Royals go well into the 80s, with cited manufacturing in Portugal, Japan, Korea and Bulgaria. Yet newspaper reports in 1979 only mention TA Frankfurt as making typewriters during the Litton-VW transition. Triumph serial numbers go up to 1977 and Adler to 1979. Do you have a serial number for the Caravan? yup, what little info I have for the late 1970's to early 1980's Royals is gleaned from a set of USA distributor brochures listing the selection of portables available to west coast dealers in those years. I haven't seen any evidence yet that the Triumph/Adler Royal-badged machines were sold in the Western US (doesn't mean they weren't, but I just haven't seen evidence), so I had no info on what years they were sold. I think we can glean from your research here that they were sold in *some markets* between the mid-to-late 70's. That's better than nothing, so I'll add a section for that to Royal soon, when I add a section for the new Chinese-made Royal "Classic". When it comes to Imperial, I'm mostly in the dark. There's some info from OMEF 1980, but I don't think that it lists the rebadged Holland machines. By 1980, I really don't get the feeling that companies were being very forthright about supplying serial data to dealership organizations anyway. Thanks Ted. As always I agree with you entirely. You and Richard might be interested to know that I checked newspaper advertising in the US and this “Tippa”-style Royal Caravan was being sold for $85.95 in the five weeks leading to Christmas 1975. Exactly a year later the price had dropped to $69.94 and $71.97. So, as I said, it is most definitely a Litton machine. Both the earlier (Safari-style) and later (Tippa-style) Royal Caravans were being sold (for $79.99) as late as August 1979. No advertising for the Tippa-style machine thereafter. Very interesting from you two. I do not have the serial number of the Caravan as it appears to have been ground off and taped over. However, Robert refers to the serial number of the Imperial 90 on his blog entry about this machine. It is because both machines have similar colouring and artwork on the brand name that I suspected that they were sold around the same period of time.What is strange is that during the mid 1970s, whilst Litton were selling numerous machines with their logo attached, they chose to sell at least these two models without the logo. The plot continues. First, tonight I found an identical machine on UK ebay referring to a serial number: 10230701.Does this help Ted? Then later on, I noticed an Imperial Saraha on Australian ebay, blue in colour and with the same artwork on the brand name Imperial as the Caravan. Thanks for this Richard, every bit helps to fill out the picture. Yes, I think Ted will be interested in that eight-figure serial number, it looks like they were numbered as part of the Tippa sequence. I have a feeling I have seen Sahara-Safaris with that same style of brand name - the one on your Caravan is certainly not new to me (the Imperial 90 aside).